Oh the irony of the post that precedes this one! At 7.40pm I was ready to leave for my Tuesday evening club run. I'd stuck to calorie limits the previous day and had followed the normal Tuesday plan of eating all my calories by mid afternoon secure in the knowledge that I'd be burning off plenty in the evening ahead of my final meal of the day. The trouble was the baby sitters hadn't turned up. They normally arrive by 7.30pm - though we said they just needed to be here by 7.45 - so I called Sue to check she's confirmed with them. No...she hadn't thought to. That meant no Tuesday run and I was fuming as it put paid to my mileage targets for the week, my weight loss targets for the day and was very, very irritating. With little food in the house it meant I turned to toast and crisps and biscuits for the mini binge that inevitably followed. Didn't feel too good Wednesday first thing (and hadn't Tuesday either) but stuck to plan during the day. I toyed with not going to the Kirkstall run but decided I must force myself out and duly turned up at 7pm. The run started off ok - straight up the 2.5 mile hill to the ring road - and after 1.5 miles I felt good running just behind the fastest runners. By 2 miles I was beginning to struggle to keep to the pace though and by 2.5 miles a deliberate slow down meant I finished some 50yds behind the quickies and felt rough. I decided I'd better turn round and head back, making it a 5 mile tempo run rather than the 7 miles planned, but after just another mile I had to stop. I was able to start again but it felt really hard work. On Thursday I needed to head to Warwick for a meeting and stuck well to the diet plan again but as I pondered the previous days on the way back I decided to completely change tack for the rest of the week - I would take the rest of the week off. No running, no dieting and no race on Sunday. I'd give myself a physical and mental break. Boy, did I put heart and soul into that! All comfort foods, many echoes of my childhood or of Christmas eating patterns. What might a psychoanalyst make of that? I suppose 'not dieting' immediately became 'binge as heavily as possible to get it out of your system'. Its had some interesting effects. - Ten days ago I was 11st 7lb - today I am 12st 2.2lb. - I've struggled to get to sleep the last few nights, have woke during the night and have felt tired in the morning. Hopefully, that's that - though this time of year is where I've ceased running and put on weight in each of the last 2 years! Gradually get back on track today with the diet and tomorrow with the running and no race pressure for 3 weeks. That's the new plan. 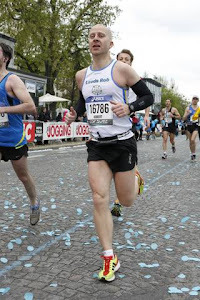 I spent much of Saturday afternoon sorting out my marathon training plan for Paris. I know its early but there was method in my madness. For one thing I wanted to get it sorted so I'd know what I needed to do in the intervening period to prepare and for the other, more practical and pressing reason, of wanting to know on what dates I should plan and enter races as these tend to be scarce in the winter so fill up very quickly - in some cases within a couple of days. I’ve very closely based the training on the Runners’ World 3:30 plan with the odd allowance for the practicalities of races and local training. Compare & contrast with this year's Paris training with it's 3 runs a week for 12 weeks, no speedwork, no races, one long run of 18 miles and two of 20, and peak mileage of just 28.2 miles in a week! Looking at it that way and the gap between now and where I’ll need to be doesn’t seem so great. I’m also going to try and have a decent stretching routine at least 4 times a week and preferably daily to try and clear up the psoas problem and any other niggles prior to the marathon training starting. Overall, I guess that was a good week. Up to four runs again, got Beth doing her first run since August, did my second longest post Paris run and had 2 good club runs. I also got my Paris training plan sorted. As has been the routine for the last few weeks, Monday started with a rest day after the exhertions at Harewood. Tuesday was Abbey, with a far lower turn out than usual, presumably down to it having rained all day right up to run time. That was a pain as I'd worn a gilet in the expectancy of getting wet but the rain stopped just as we headed out, and with no rain and no wind it was warm! It felt a fairly tough 7 miles (the reverse of the previous Tuesday's route)with my legs feeling tired after Sunday's race. Next day it was Kirkstall. Despite the (even hillier) 7 mile route I probably felt slightly better and was able to push myself fairly hard for the last 5 miles - even surviving the hard slog up the ring road from Rodley to New Roadside. Thursday and Friday were rest days once again and then on Saturday I cajoled Beth into doing a slow 2 miles along the canal. She was reluctant to go but I think she enjoyed it in the end as the weather was good, we saw some Abbey runners and she had a few questions about canals and railways. Yesterday was initially meant to be a cross country race day but in the absence of getting any information on it I decided to do a long slow run. At first I thought of 12 miles then decided I should up that to 14. It proved tough. I've done alot of training and racing since the end of July that's conducive to speed and endurance for up to 10 mile races but I'd only once ran over a half marathon distance (over 2 months ago) so I'm possibly lacking in the extra endurance and certainly not used to the extra time on my feet that 14 miles at a deliberately slow pace entails. That's a bit of a worry ahead of the Bridlington half next week, but there is hope! I've recently entered the Central Lancashire half for the 3rd January so Brid is the first of 3 decent PB attempts at the distance and yesterday's run and next week's race will certainly help in terms of training for the Lancaster half on 8th November. Plus, next week I'll run at a faster pace so at least I wont be running for so long. When I did Weight Watchers 12 years ago I went from exactly 14 stone to exactly 12 stone. The latter was the target that was suggested by the WW leader and felt pretty good when I reached it. As a result I'd always held that as the figure of where I wanted to be and where I should be. I knew it was at the high end of my healthy weight range but I always felt I was naturally broad shouldered, muscular and 'big framed' so it was right for me. Roll the calendar forward 8 years to September 2007 and after (frequent) weight gain and (occasional) loss I joined http://www.weightlossresources.co.uk/ with a view to getting back down again but this time to a target of 12st 7lb as I figured that maybe 12 and a half was right for the older me! In fact through much of the next 18 months my weight went up and down as I struggled to stick to calorie control and never once did I get below 13 stones. A year ago, as I blogged a good while back, I decided to move the goalposts to an ambitious target of 11 and a half stone for Paris marathon but failed to start dieting until January by which time that wasn't achieveable. At that point I set my aim at 12 and a half by Paris and then switched again to 12st - eventually getting down to 12st 2.8lb the week before, but still held the long term aim of 11st 7lb. Since Paris I've gone up and down a couple of times (immediate post Paris relaxation then on summer holidays) but overall its been a downward trend and today I finally hit 11st 7lb. Fantastic eh? Trouble is I decided in August to drop my target again, to 11st exactly - the mid point of my 'healthy' weight range - figuring I could still lose a little more and that the weight loss would help my running. I'm in with a shout of getting there before my 40th on the second of November and before the big 3 PB attempts at 10k, 10 mile and half marathon during that month. Thing is the closer I've go to 11st 7lb the more I've began to toy with the idea of dropping just a little below 11st or even of trying to get down to 10st 7lb. I can't decide if this is good or bad thinking! On the positive side my apparent body fat percentage says I should certainly be able to drop further (and less fat equals faster running) but I do wonder if there's more to it than that. Am I scared of hitting a final target? Am I getting addicted to dieting? Do I not trust myself to be able to maintain my weight? These are questions that may link to my occasional binge eating - is moving the goalposts ever downwards motivated by the same desire that causes me to try and sabotage myself from time to time? Best do the old running round up for last week now! It all started rather painfully. Two races in two days had taken it's toll and everything (almost!) south of my waist was stiff and painful; particularly my glutes and calves. I couldn't even walk properly. All that meant that Monday was a rest day and on Tuesday I booked for a massage for the following day. I did manage to run Tuesday evening with Abbey. A shade under 7 hilly miles. Felt stiff at the outset then it slowly eased through the run, though running downhill I could feel it in the glutes and when faced with a short steep hill my calves felt absolutely dead. The massage the next day wasn't pleasurable - the pain on massaging the knot(s) in my glutes was strong but hopefully it did some good and I did just over 7 equally hilly miles with Kirkstall that evening. That was done slightly slower, with a couple of stops en route, though my legs (and me in general) felt tired and not up to speeding up. Rest was the plan for the remainder of the week though I did go out for an hour's bike ride on Thursday which also seemed to help the legs feel better. I had thought of taking Beth out for a short run Saturday as she's only ran twice since July but other plans for her and the rest of the family precluded that, so the next run was the Harewood 10 mile trail race on the Sunday. I did this race in 2006 and it was fairly tough - with a fair amount of climbing and downhills, 2-3 stiles, lots of narrow trails and a final mile that was almost entirely up a steep climb contributing to a course with a net ascent of about 120ft. It was good running weather - bright, breezy and cool - and there was a good showing from Abbey with a dozen or more running it. The first mile is pretty much flat overall and the second has a good descent and this, combined with my finding myself nearer the front than I intended led to the first 2 miles being over 40 seconds ahead of target pace (having used the road PB from Wistow as the target even though this was an appreciably tougher event). Mile 3 was all uphill barring a very brief drop at the end and that immediately wiped out the time in the bank and put me about 7 seconds down overall. It also left me pooped for the undulating 4th mile as we headed across fields to the flatter environs of the reservoir and after 4 miles I was down by 22 seconds. Theoretically that should have been the cue to speed up a little and claw that back - a couple of flat miles that would allow me to get some sort of rhythm going - but the legs still didn't feel quite able. Not sure if it was still after effects from the previous weekend, the early hills or the pace but I had dropped a further 30 seconds by the time I reached the 6 mile mark. I lost more time in mile 7 as we left the reservoir across undulating fields before joining a narrow track where I spent a bit of time boxed behind a tiring runner. I'd felt very fatigued at the beginning of that mile but the slower pace on the trail allowed me to recover a bit, and whilst I lost another 30 seconds in that mile (now 83 behind) I felt good going into the friendly mile 8. Here there was a gentle downhill for the mile and I was able to claw back 10 seconds. Then, in mile 9, there was a steady and occasionally steep downhill that I could fly down and in the process pull back another 35 seconds. Had it been a flat last mile I'd have then had a chance at hitting the target but immediately at the beginning of the final mile you're faced with the first of two steep climbs going straight up ahead of you. Mind you, I'd used the road PB as a target but realistically I just wanted to be vaguely close - maybe within two minutes - as that felt like a reasonable comparison bearing in mind the gradient and terrain differences, and I was well on course for that. The last mile consisted of the first steep rise for maybe a third of a mile, then 100m or so of flat, before another equally steep climb that's a little more than a third of a mile and then the final 400m that's at best flat or at worst a very, very slight incline. The first climb was tiring but for the second I was able to pass a couple of runners and still have enough breath left to speak to another runner who laboured past me - presumably she didn't have enough breath as she completely blanked me and my compliment about her hill running skills! I speeded up a little to the finish - enough to keep the runners behind at bay without wishing to pass the ones in front or go all out. Final time was 40 seconds slower than Wistow 3 weeks previously. That felt good and when I looked at other Abbey Runners times (who had done both races) they were all between 3.5% and 9.5% slower whereas I was less than 1% slower. Whether that showed that I could have done more at Wistow or that Harewood was particularly good I can't be sure but I guess its good news either way! Time for a post on weight loss and binge eating. Not had one of those for a while. Maybe it'll help in the future if I've jotted down a few thoughts now. By the 24th of September my weight had fallen nicely down as far as 11 stone 9lb - the lowest I've been probably since my middle teens. I felt good. I was on track to hit my target of 11 stone before my 40th birthday at the beginning of November, and thought of myself as being 'about 11 and a half stone' and slim. I then had a bit of a heavy few days food wise. This was partly because the in laws visited from Thursday to Saturday (meaning fruit pie, a meal out and a relaxed day or two), partly because I didn't run Thursday or Friday, and partly because after the races on Saturday & Sunday I felt like comfort eating and that I deserved it. I did mange to resist another meal out on the Sunday evening but that just led to a mini binge on cheese, toast & butter! Net result was that on the following Monday Morning the scales said 12st 1 lb! Now, I know that thats a 'false' weight gain - as much to do with water retention and the weight of the food in the gut after over eating as any genuine weight gain - so I didn't panic. Instead, I went back to basics of dieting and exercise and by Thursday morning was down to 11st 10lb. Trouble is, that was the high point! I did ok through the day on Thursday but in the evening went out for a curry with friends. It wasn't a weight loss day as a result but I resisted the temptation to buy illicit chocolate on the way home. Friday started with good intentions but by the middle of the day I was feeling tempted to nip out for a quick treat lunch out despite knowing I'd got a big (and rather nice) casserole for tea. I resisted once more but again this led to bingeing in the evening - huge amount (8-10 slices or so) of toast and butter (again after a very large tea) plus assorted picking at cheese, snacks, dried fruit, fruit buns and some newly discovered digestive biscuits. Saturday was even worse. During the day I had 6 chocolate bars and half a bag of fruit pastilles alongside many, many more slices of toast and butter, fruit buns, digestives and 3 decent meals! On Sunday I ran a tough race and managed to limit myself to only the four chocolate bars and the other half of the pastilles alongside a huge roast dinner and - you guessed it - yet more toast and butter, biscuits and assorted picking. The scales today were 11st 13.2 lb. At least its under 12, but the lost time and weight gain now mean even at 2 lb a week loss I won't hit my target until the 22nd of next month. This pattern of weight loss and bingeing is long established so is there a trigger? Stress - especially work and/or money worries - seem to leave me more open to wanting to comfort eat. Funnilly enough money worries leave me wanting to spend too! Denial - it seems (from this weekend) that if I deny myself a treat (like the meals out) there's a fair chance my response will be to binge on other things which will ultimately be far worse. Worry is though, if I gave in to the initial temptation would the bingeing follow anyway? Not exercising - not sure how much of a trigger this is but if I go for more than 2, maybe even 1, day without running I'm more likely to go into binge mode. Exercise seems to give me discipline (post 10 mile run mini binges not withstanding). Complacency - when I've had a few weeks good loss and am feeling ahead of the game I seem to get tempted to go off the rails. Maybe that's a response to a too strict period or maybe its simple complacency. I don't know. I do think that the likelihood of bingeing (and its severity) are linked to these triggers working in combination though. I can even recognise them at play. Trouble is recognising them and finding a way of not acting on them seem two very different things and words and phrases like sabotage and self destruction seem very accurate. Had a rest day last Monday following Sunday's exertions then ran as normal with Abbey on the Tuesday - 6.7 hilly miles averaging (despite a slow first couple of miles) 7:45 a mile. 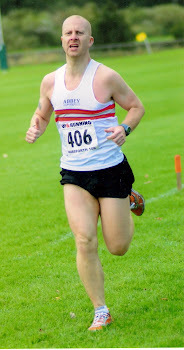 Next day I ran again, this time with Kirkstall Harriers. They run Mondays & Wednesdays so there's the option to join them as second claim club as the training fits nicely around the Abbey nights. My thinking is that during the winter when its dark and wet it'll be difficult to motivate myself to go out and keep up with the planned marathon training but if I have routine club nights I'll stick to them. Similar sort of run - hilly 6.77 miles with a couple of slow miles at first and a final average of 7:49. Thursday and Friday were rest days ahead of Saturday's trail race, the Saab Salomon Turbo X in Sheffield. That proved to be a very taxing race. It consisted of a 10 mile route through woods, up and down extremely steep hills (on all fours to get up some of them), over felled trees, through a couple of becks and also several hundred yards of mud filled trench with the stinking grey mass between knee and bum height! I got round ok but it was far more tiring than the 10 miles (or time that was 30 minutes slower than my pb for the distance) would imply. Really good goody bag and Salomon technical running shirt though. I finished 94th out of getting on for 400. 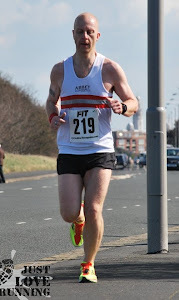 The next day was the Horsforth 10k. I know, its crazy to do two races on consecutive days, but it was local and as I'd payed my money I wanted my t-shirt! Trouble was, my calves and glutes were really stiff and sore when I woke Sunday morning. I don't normally get any post race DOMS so it showed how tough Sheffield had been the day before. I got there early, did half a mile warm up and had a really good stretch. I felt better after that - still sore but ok. The course profile is 2 miles uphill from the start along narrow private road, then 2 miles downhill to the canal, followed by 2 miles flat along the towpath and a couple of undulations in the last 0.2 miles to the finish. I started a bit further back than I intended and was boxed a bit for the first mile. The uphill was a real challenge to aching calves and by the end of the second mile I was 67 seconds off target pace. I accepted then that a pb wasn't on the cards but recovered about half of that time in the next 2 miles of descent. The canal section proved to be the most difficult. By that time my legs felt uncharacteristically tired and, feeling the effects of the previous day, keeping close to pace felt mentally very, very tough. I managed to pass a few people and battle it out with a girl from Kirkstall (eventually giving in on about the 4th time she tried to pass me) which helped drag me along but I lost about another 8 seconds by the time the 9km mark was reached. I speeded up a bit then though and had a sprint finish of sorts, probably passing another half a dozen people, finishing in 46:13. That's 10 seconds away from the pb but considering the course profile and my legs being shot I was very pleased! ...but that's the story of the first half of this week!